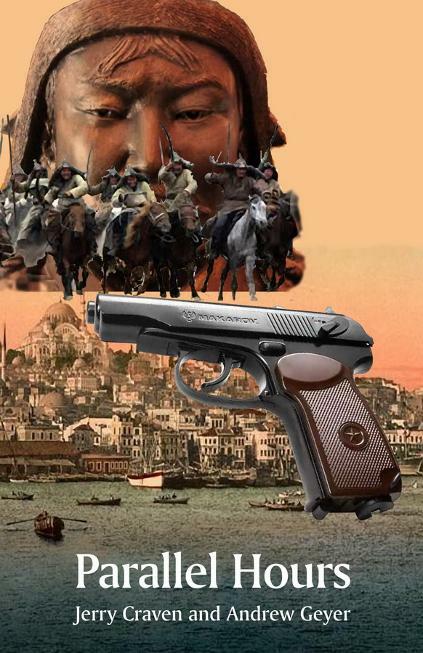 This barnburner novel gets underway with parallel catastrophes: the murderous Russian invasion of Baku in 1990 and the Golden Horde of Genghis Khan that destroyed the city in 1221. Thus begins a fascinating tale of alternating time planes when a misstep in either might alter—or abolish—history in both. The authors tease us with classic time-travel paradoxes—the butterfly effect, the predestination paradox, the nature of time, and above all, the moral choice Tejmur must make to kill or spare the life of Genghis Khan. But while these alternatives enrich the narrative and open up possibilities undreamed of in our supposedly linear time, they do not supplant the prevailing human qualities of love and loyalty. The possibility of time travel remains unsettled, but there is no doubt about its grip on our imagination. 'Parallel Hours' is one of the most skillfully crafted work in the genre. Co-authored with Jerry Craven, and published in 2017 by Angelina River Press, Parallel Hours is Andrew Geyer's first foray into the alternative history/science fiction genre. In a time-travel tour-de-force worthy of Harry Turtledove himself, Craven and Geyer put their considerable knowledge of history, geography, and rollicking good storytelling to excellent use, crafting a fast-paced and thematically rich narrative that will stay with you long after you turn the last page. In this mesmerizing mixture of historical and science fiction, Craven and Geyer have created a world where a window connects the years 1221 and 1990. Through its compelling storytelling and harmonious blending of two accomplished writers' talents, Parallel Hours is an experience you should not miss.